In my last appointment, the doctor stressed the importance of cardio. I told her I’m an avid yogi (ok, maybe not as avid as I’d like these days…) but she was adamant that something to get my heart rate pumping, even as simple as a couple of family walks each week, is crucial to my health. Message received, doc! The good news is that while exercise may be a grind, it’s as good for your skin as it is for those love handles. I am all about efficiency, so as I dug into this topic, I was thrilled to find all of the many skin benefits of exercise. Spending 30 minutes doing something that is good for my body from head to toe? Now, that’s something that I can get behind. Please let the records show that I despise sweat, however it turns out that a good sweat is actually glorious for your skin. It can act as a mini steam facial, pumping all of the dirt, grime and oil out of your pores. Just be sure to clean your face quickly once your workout is done (check out some of these amazing cleansers). Letting all of that toxic sludge sit on your face for any length of time can be problematic, so just be sure to pack your favorite toner or facial wipe in your gym bag to keep breakouts at bay. When I went through a period of slight insomnia, the experts told me to work a light exercise regimen into my routine to tire myself out a bit more before bed. They were spot on – because I notice that I sleep like a baby when I am working out regularly. Better sleep means fewer dark circles, more time for those overnight masks and treatments to work, and overall, a more restful recovery time – crucial to the cell renewal that keeps you looking young. Beautiful! It’s no secret that exercise improves your circulation, which is excellent for you all around, but this little perk is perhaps nowhere more visible than on your visage. When your blood is pumping in the right rhythms, your face will glow from the effects of receiving increased blood and oxygen. I also find that my face tends to plump up a bit after a good sweat session. My secret to help increase the amount I will perspire is to apply slimming CREME 155. An added bonus from a blend of maritime pine and wintergreen essential oil s especially recommended for very active people to prevent soreness after exercise. Two of the most frustrating skin conditions – acne and eczema – are exacerbated by stress. Because exercise is known to lower your stress levels, those pesky oil-producing hormones will be kept in check, helping you to enjoy clear, calm skin on the regular. As an added bonus, I know that the lovely “11” lines in my forehead become much more prominent when I am stressed. Less stress equals a more relaxed brow, which means maybe I can hold off on the Botox? Those are just a handful of ways that exercise can improve your skin – and actually help you to look younger. So, while some may enjoy a runner’s high, I’m now all about that yoga glow. Have you enjoyed the positive and pretty skin effects of regular exercise? Do share with us below! 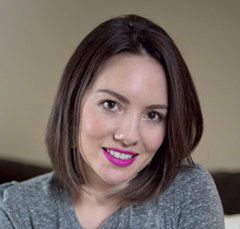 Lara Ramos is the voice behind popular beauty blog, The Glossarie. She translates her passion for products into writing in an attempt to help her readers to build a prettier lifestyle, starting with their makeup bag. Lara’s exclusively-positive reviews focus on quality, highlighting things that are as effective on the inside as they are beautiful on the out. When she is not blogging, Lara enjoys snuggling her newborn daughter and exploring her home city of Washington, DC with her husband, Steve.